I'm starting this post with a bit of a confession. I was recently invited to new restaurant Hinnies, but I had absolutely no idea what "hinnies" meant and had never heard the word before. I may have lived in the North East for a few years now but I learn new Geordie sayings and words every week, reminding me that I am still very much the "New Girl in Toon". Luckily I've made myself some great Geordie friends who are my tutors in my quest to learn the lingo of my new home. So I can tell you that "hinny" is a term of endearment, a little bit like "honey". Geordie slang lesson over, I'm actually here to tell you about new restaurant Hinnies that has just opened in Whitley Bay. 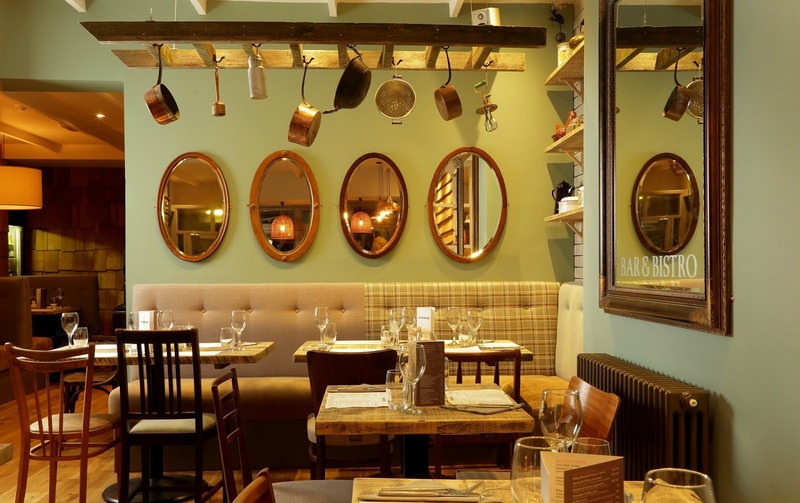 Hinnies promotes everything that I look for in a restaurant - a relaxed, warm and friendly experience and a menu of hearty Geordie influenced classics using local and seasonal produce. My idea of the perfect comfort food. If there's one thing I love in the Winter its a belly full of warm food so I headed to the coast with my friend Sam for an evening of fresh sea air, gossip and some delicious food. Walking into Hinnies we immediately both commented on how lovely it was to see a restaurant so busy on a Wednesday evening. It seems that the restaurant is already a roaring success and it's no surprise. It's been a decade since owner, Andy Hook (who also owns Newcastle's Blackfriars Restaurant) sold his first restaurant, Sidney's in Tynemouth and locals have clearly been waiting for his return to the coast. This time Andy has set up home on Whitley Bay's seafront which is currently part of an exciting £32 million redevelopment. Having seen lots in the local press about the plans for Whitley Bay, I'm very excited about the future of the seaside town. The interior of Hinnies is warm and comfortable with a beautiful coastal colour theme of warm natural wood features mixed with a range of vintage furniture and fittings. We were interested to learn that most of the things round us were recycled including the tables, chairs, booths, light fitting and front bar - even the cutlery! I'd spent most of my day eagerly studying the Weekday Dinner Menu, not that it helped with my decision making. It's not often you find a menu that's crammed full of so many delicious sounding dishes that you want one of everything. The Weekday Dinner Menu is available from Tuesday to Saturday and is a very reasonable £12 for two courses or £15 for three courses if you dine between 5:00 pm and 7:00 pm. 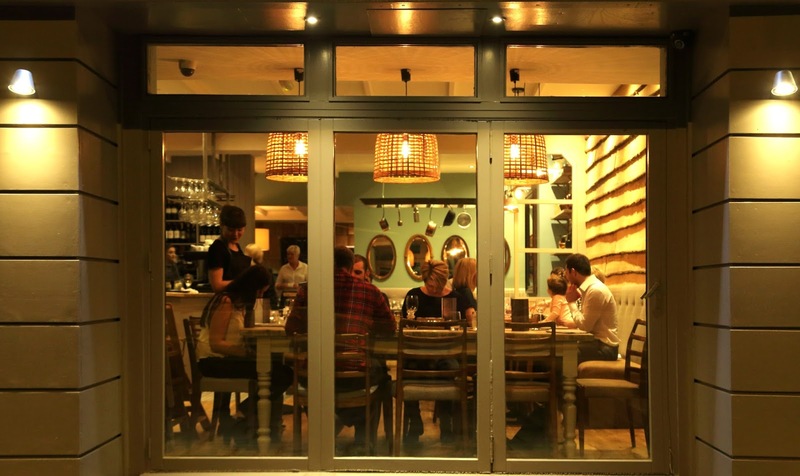 If you're a fan of Blackfriars you'll be excited to hear that Hinnies showcases Blackfriar's best-selling dishes over the last 10 years, but with more of a Geordie twist. 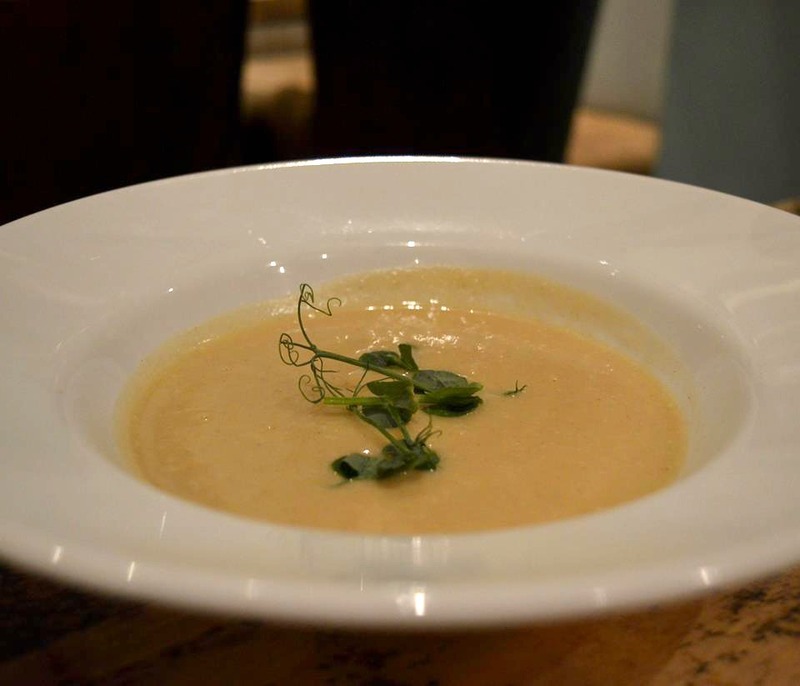 North East coast creamy crab soup, Slow-roasted belly pork with pease pudding and Creme brûlée served with Tynemouth Garibaldis are just some of the locally inspired treats you can order. There was a generous choice of 9 dishes on the Starter Menu plus some amazing sounding Specials. 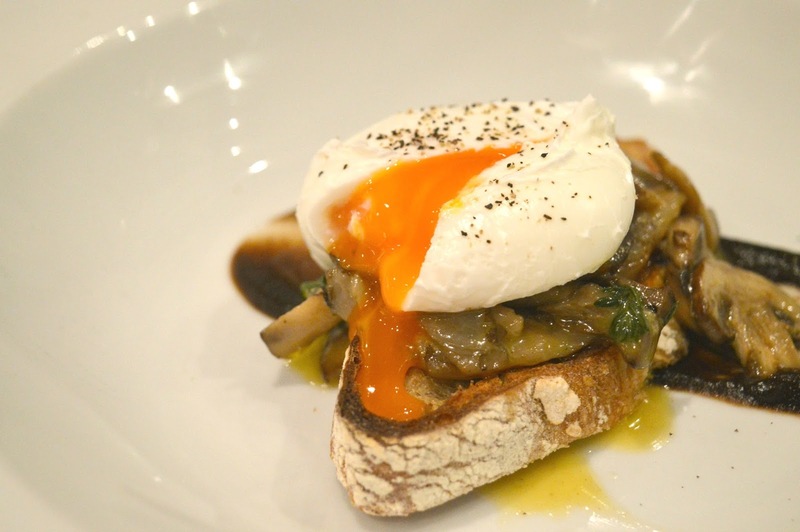 I ordered the Foraged mushrooms on toast with poached hens' egg. It was absolutely beautiful, I was quick to pop the egg wanting the full delicious experience of the yolk with the mushrooms. Heaven! Wanting to warm herself up after our brisk walk in the night time sea air Sam decided to order the Special - Cauliflower soup. I was a little jealous watching her eat the soup, it looked really thick and warming, the perfect dish to order after a seaside stroll. For the Main Course I decided to order a local dish that I hadn't had a chance to try before. 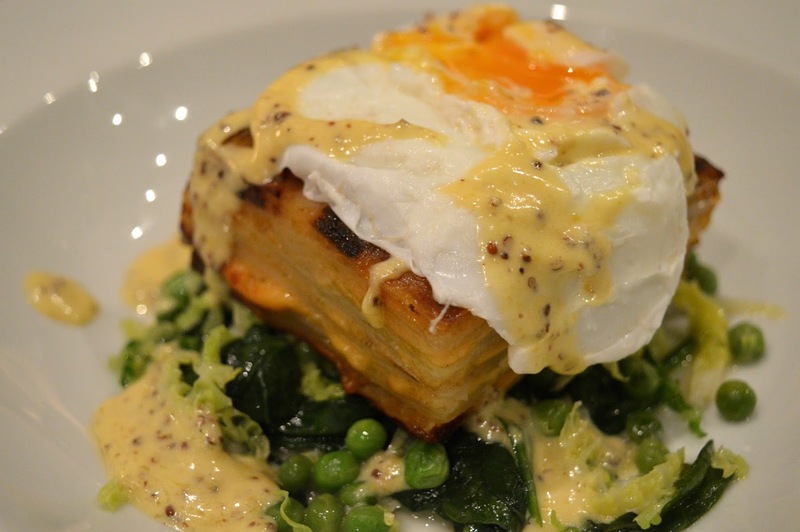 Pan Haggerty served with greens, poached hens' egg and mustard cream. For those of you who aren't from the North East, Pan Haggerty is a delicious combination of potatoes, onions and cheese and I can't believe I hadn't tried it before. I really loved it and am very pleased I can now tick it off my Geordie list. 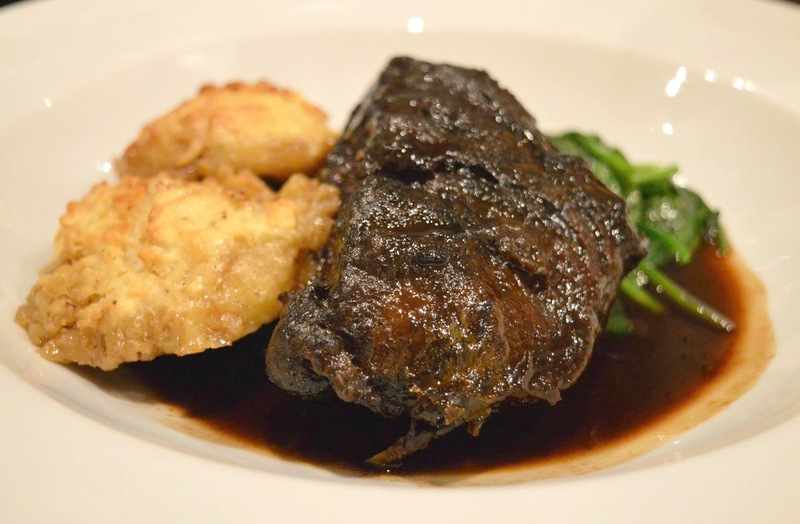 Sam ordered the Newcastle Brown Ale slow-cooked beef with horseradish dumplings. Now we all know that I'm guilty of stealing food off my boyfriend's plate but I tend not to wave my fork in the direction of a friend's food. But I couldn't help but get slightly crazy food eyes watching Sam tuck into her meal. The beef looked absolutely beautiful and sensing my interest Sam very kindly offered me some to try. Wow! I don't think I've ever had beef so tender. I'll definitely be ordering the beef next time I visit Hinnies. By this point we were pretty full but it's not often I can turn down pudding, especially when the menu is full of some of my favourites. 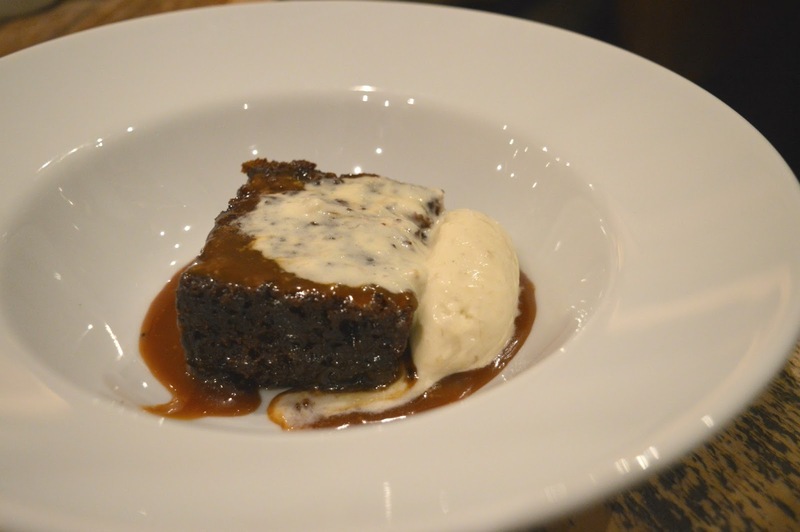 I was very tempted by another local dish and the restaurant's name inspiration "Singin Hinnies" but in the end opted for the Sticky toffee pudding with salted caramel sauce and banana ice-cream. I was a little disappointed that the ice-cream ended up being a vanilla flavour rather than banana but all was forgiven as soon as I took a spoonful of the pudding, it was love at first bite! 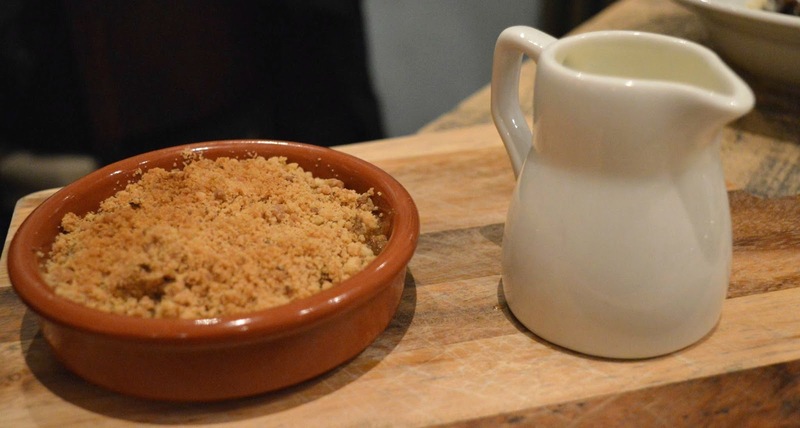 Sam ordered a perfect Winter warmer with the Spiced apple crumble and custard. The jug was more than generous and she was pouring lashing of delicious hot custard all over her pudding. It looked amazing. We loved our first experience of Hinnies - the atmosphere, food and people were all fantastic and we both agreed that we'd make plans to return with our other halves. Its not all about Dinner at Hinnies it's also a great spot for Lunch and has a rather epic Weekend Brunch menu including some tasty sounding breakfast dishes that are served between 9:00 am and 12:00 pm. Personally I have my beady eye on the Corned beef hash, Eggy bread and Poached eggs. If you have kids to keep entertained then the "Wor Bairns Scran" (that's Geordie for "food for your kids", incase you didn't know) looks great fun with make your own pizzas and decorate your own ice-cream. As for me? I'll definitely be returning to Hinnies, probably for some Weekend Brunch, and I'm pretty sure there's some Singing Hinnies with my name on! Great review Chloe, it sounds like you and Sam had a great night. It's such a gorgeous little place, just what Whitley Bay needs! We're going to have a mums night out there soon and I can't wait!!!! I'm glad you explained what Pan Haggerty was because I didn't have the foggiest idea aha! It all looks so delicious and I love how they've used so much recycled material in the restaurant. I'll definitely have to put this down as a place to visit if I get the chance to go up north! I'm also surprised at the reasonable prices too, I know places that charge vast amounts more and the food doesn't look half as good in those places. Oh my goodness this looks delicious. I need to explore Whitley Bay some more. Maybe when the weather is a little bit warmer.